The moment we are born into this world, where each man only ruminates for himself, there are a few beloved ones out there who set an extra mile without hesitation to ensure our happiness. “Other things may change us but we start and end with family”- This wall decal describes the importance of a Family, it brings together the sacredness as well as the mystery of how a family upholds in every life’s aspect. No matter how far the distance that keep us away from our family, at the end of the day we always look forward to unite with our love ones. Family is a priceless gift, it is a circle of strength and love. In every crisis faced together in the family, it makes the union stronger. No one can ever describe how a family can bring bliss, laughter and even tears. The values and radiance that a family can bring will surely stay and guide us from the rest of our lives. The wall letters here with Decal Style 2 at 5 ¾”h, that we specifically placed above the sofa and beside the window in the living area so one can see it easily and rekindles the deepness of its meaning, it can also be placed on the wall or right below the ceiling with pinlights of the family hallway. You can also place it above the main window of the family room. In an area where there is no window or natural rays from the sun that can pass through, this wall quote can also be placed near the wall sconce to give additional value and creativity on the wall quotes. The font of the word ‘family’ with a decorative end is bigger compare to the other words to give emphasis. Tan and Chocolate Brown colors are chosen for the fonts to blend the earth colors of the area. 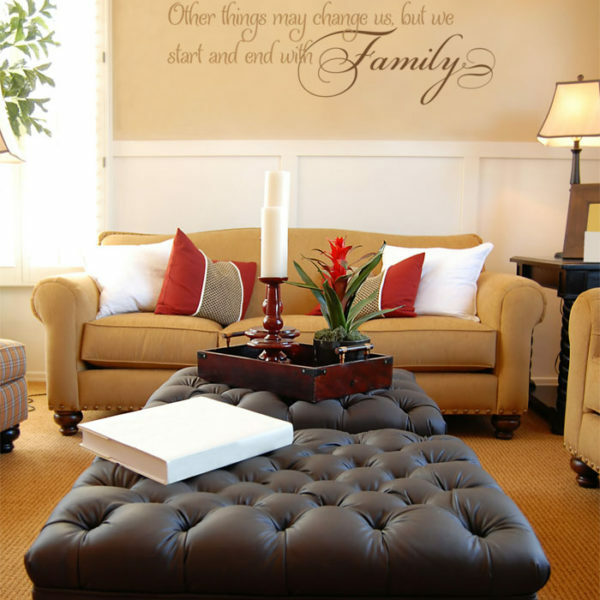 This living room photo is an excellent example of a nice area to place this wall lettering; where the focal point is the brown classical style sofa with the blue ottoman. The traditional motif side table with a lamp shade on the table top adds beauty and fullness of the design. The color Blue of the ottoman as the main contrast, balance the Brown color of the wall and the sofa. The plants on the side and the flower in the service tray, makes the area alive and full of life. The candles and the book which are added as accessories, complement and adds energy and spirit. The wall panels painted with the neutral color of White brightens and softens the solidity of the colors of Brown and Blue. A soothing ambiance, with a perfect color combination unifies the mood and tranquility in the area. The throw pillows, brings relaxation. The ottoman which is located on the center, serves as a table where you can place things at your convenience or just simply a comfortable cushion seat that you can rest and makes it more homey. In our lettering art section, you can find a lot of good ideas to choose from, in different sizes and colors. If you are still uncertain on how to mix-match the color combination and correct tones?